Between 2012 and 2015 Sport in Desford (SiD) installed 176 solar panels on every available roof. of the SiD clubhouse, generating around 40,000 KWh p.a. Following the installing of LED lighting in main rooms, corridors and for security lighting we managed to reduce our demand (consumption) from 46,000 KWh down to 36,000 KWh p.a., meaning that over the year we are now generating more electricity than we are consuming. However our generation necessarily occurs during the day, whilst the greatest demand is in the evenings , for lighting and floodlighting. 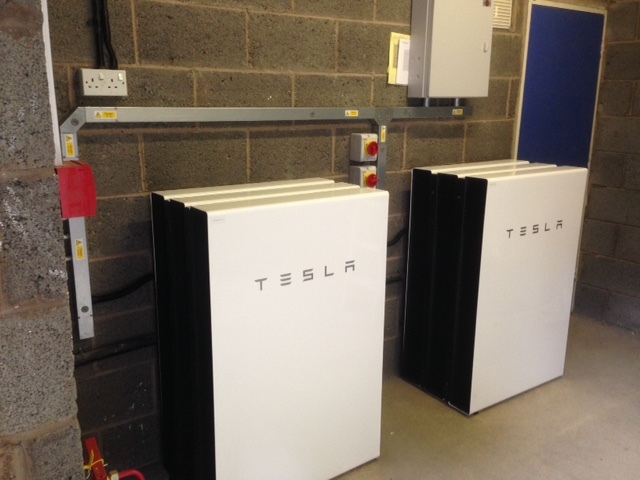 As a result SiD recruited Carbon Legacy Ltd to install 6 Tesla Powerwall 2 batteries in May/June 2018 to store daytime electricity for consumption in the evening, with 2 batteries on each phase of our 3 phase supply with a total capacity of 78 KWh. This is the first installation of this size in the UK and we are pleased to say that it is working really well so far. We estimate that this will allow SiD to use about 70% of our generated electricity on site instead of the previous figure of 35%, which we hope will save SiD around £1,500 each year on electricity being imported from the grid. SiD is indebted to Pure Leapfrog, Postcode Local Charitable Trust and Derbyshire Environmental Trust for providing the total funds to complete this project and to Carbon Legacy Limited for an excellent installation.